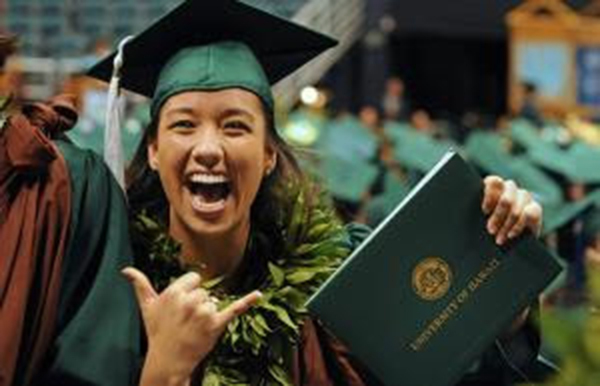 The four-year graduation rates for Native Hawaiian and Filipino students at the University of Hawaiʻi at Mānoa have reached record highs, according to a news release from the university. From 2010 to 2018, the four-year graduation rates for first-time freshmen increased from 10.3 percent to 32.3 percent for Native Hawaiian students, and from 13.8 percent to 37.7 percent for Filipino students, UH said. The overall four-year graduation rate at UH Mānoa is now at an all-time high of 35.2 percent in 2018, a 1.2 percent increase from the record set in 2017 and 17.4 percent increase from 2010.